Melanie Spring has been with the Myotubular Trust since November 2008, and is the first point of contact for families, the medical community and researchers. Anne Lennox, mother of Tom, is one of the Founders of the Trust, and runs the Trust on a day to day basis. Anne is our Chief Executive. Wendy Hughes, mother of Zak, is one of the Founders of the Trust and provides families and individuals with support, as needed. Professors Dubowitz and Muntoni are based at one of the largest Paediatric Neuromuscular Units in Europe which has been designated by the Department of Health as a National Reference Centre in the UK for a series of congenital neuromuscular conditions. 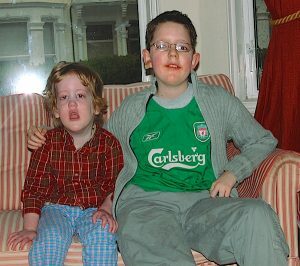 Tom Lennox and Zak Hughes, 2006.